Backgroud: The present study aimed to investigate the association between immune cells and gestational diabetes mellitus (GDM) and identify a reasonable predictor of insulin resistance in women with GDM. Objective: The clinical and biochemical characteristics of 124 women with GDM and 168 healthy pregnant women were compared. Methods: The percentage of immune cells in the blood of the subjects was analyzed by flow cytometry. Pearson’s correlation analysis revealed the correlation between the percentage of B lymphocytes and insulin resistance. A cutoff point was determined for the percentage of B lymphocytes, based on insulin resistance, using receiver operating characteristic (ROC) curves. 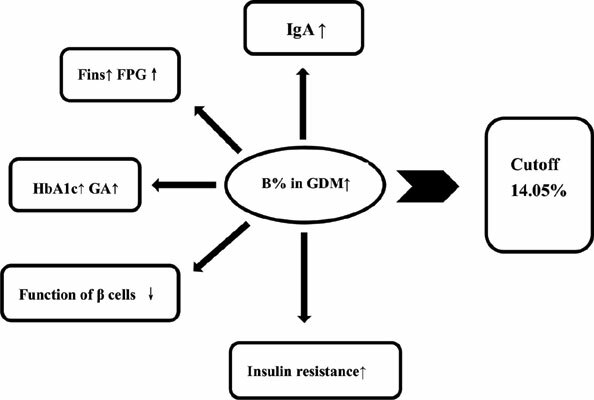 Results: Compared to the healthy pregnant women, the percentages of B lymphocytes and IgA produced by B-cells were significantly different in women with GDM. The percentage of B lymphocytes was positively related to insulin resistance.The number of 14.05% of B lymphocytes was an optimal cutoff point that predicted the insulin resistance in women with GDM. Conclusion: The percentage of B lymphocytes was positively associated with insulin resistance, and hence, might serve as an appropriate predictor of insulin resistance in women with GDM. Keywords: B lymphocytes, insulin resistance, inflammation, GDM, immune, IgA, flow cytometry. Keywords:B lymphocytes, insulin resistance, inflammation, GDM, immune, IgA, flow cytometry. Alginates in Pharmaceutics and Biomedicine: Is the Future so Bright?